Startapp is a platform bound to help app developers monetize their apps without the need for embedding banners or other more or less crude forms of refinancing means. Instead the service promises to monetize search traffic. Rings familiar to your ears? Well, the strategy resembles that of a quite popular search engine located in Mountain View. No matter if you have doubts as to how much sense this strategy might make or if you think this business model sounds promising, the infographic, we have for you today, is interesting no matter what. 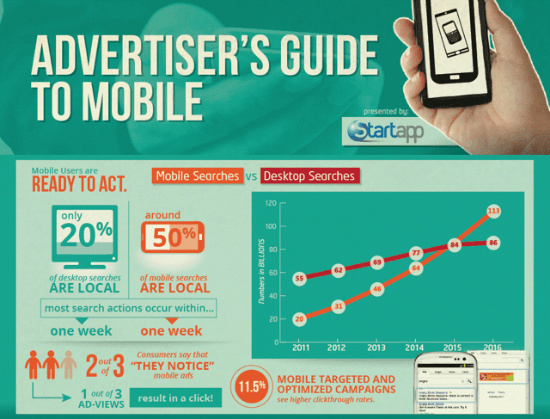 Entitled “Advertiser’s Guide To Mobile” they accumulated several studies to an easily consumable graphical overview. The massively growing fraction of mobile web users will overtake the fraction of desktop web users in a mere few years. Facebook proves as a living example for the shift in importance. In 2011 mobile ad revenue was zero, in 2012 already around 340 million USD. Given the rise does not slow down, 2013 will see almost triple that amount. I was not surprised to hear that restaurants are a popular subject of mobile searches. It is not surprising that 64% of all searchers convert to customers within one hour of searching, 84% during the course of the same day. Already today between 30 and 50% of all restaurant searches are mobile. I admit, I was really surprised to have to take note of the fact that almost a third of all searches for automobiles are initiated from mobile devices. An astonishing 51% of all searches results in sales. The industry could do so much more, as only 6% of all automobile-related websites is mobile-friendly. A very helpful infographic. But a lot of website don’t support mobile yet. Nice points on mobile ads, Dieter. Unfortunately, too many websites are not yet mobile-friendly, even when some companies are using mobile ads. So especially in today’s world, every business needs to make sure that their website is mobile-friendly, either through use of responsive design or a separate mobile website, then make their ads relevant to mobile users. That was exactly my recommendation at the end of this article. i wanted to know what is Infographic please let me know if anyone is here………………. This is a amazing article and stats are so true of what the future brings.